I was born in Wisconsin and have lived here almost all my life. I'm amazed by the beauty of our farm animals, and am aware that these four note cards don't encompass all of them, but at least a good start. I hope you will like these cards as much as I do and will enjoy sharing them in your correspondence. THIS LISTING is for one set of four premium photograph note cards, 'WISCONSIN FARM ANIMALS' It includes Amish Boy Mowing the Hay Field; Cooling Off in the Creek; Corn Thief; and a Rooster Scoping out the Barnyard. 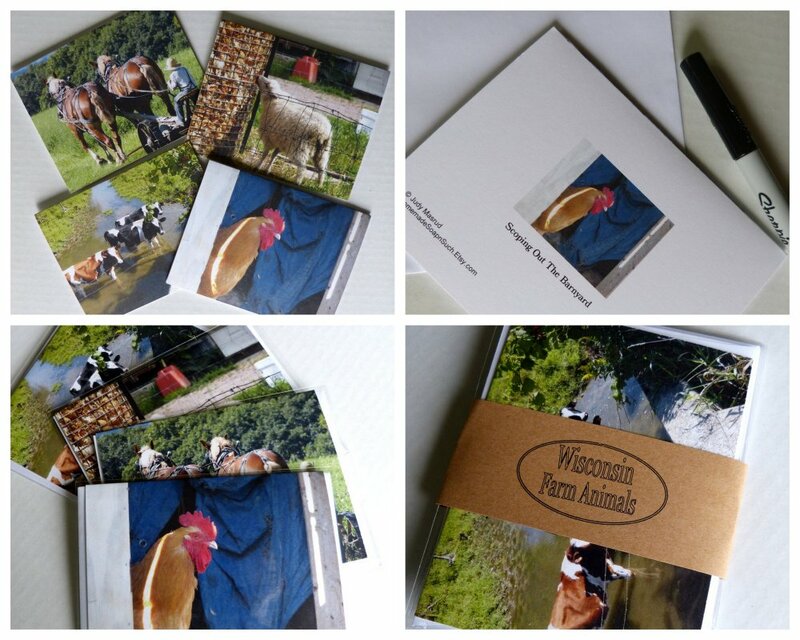 Your set of Wisconsin Farm Animals photo greeting cards will be shipped in a rigid mailer to protect them from damage.